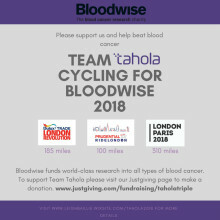 Team Tahola are cycling to raise money for Bloodwise, in 2018 we will be taking on three challenging cycling events throughout the year: London Revolution, Ride London 100 and London to Paris. As a company we wanted to take on some activities that would challenge us and bring us closer together as a team, but whereby we could also give something back by way of fundraising for a charity. 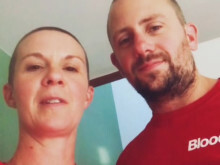 Bloodwise is a charity that is close to our hearts for many reasons and so as a team decided that we would focus our fundraising efforts in 2018 to help make a difference, to stop people dying from blood cancer, to make patients lives better, and to stop blood cancer happening in the first place. Therefore the reason for contacting you is that we would like to ask if you would be willing to help us make a difference in the fight against blood cancer? As we are asking for your support, it is probably appropriate to outline exactly what we are committing to and how we would like you to help us. We initially decided that we would ride London to Paris for Bloodwise. For four days in September 2018 we get to look and feel like a pro-rider. There is no other event like it as you ride as part of a peloton with rolling road closures, technical and physio back up teams and a dramatic and always emotional Arc de Triomphe finale. From the rolling hills of Kent to the plains of Normandy; from the streets of London Town to the Champs-Élysées, this is truly an unforgettable, life-changing experience. Riding with hundreds of fellow bike enthusiasts, led by experienced ride captains for four days through beautiful countryside, cheered on by street-side supporters and flanked by motorcycle outriders. This is the ultimate cycling experience. However, we felt that we could go one step further and add some other cycling challenges into the mix. The thinking behind this was, that if we wanted to appeal to organisations like yours for support and sponsorship we really needed to push ourselves. That is why, we are not just taking on one, but have committed to three cycling challenges. We will individually be cycling more than 1000km (with many, many more km in training rides and turbo sessions). We hope that this will prompt you to dig a little deeper and help us exceed the £10,000 fundraising target, that we have set for ourselves. 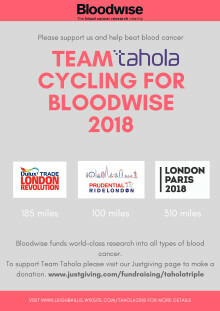 So after speaking with the event organisers at Bloodwise we decided to include London Revolution and Ride London 100 to make the Tahola Triple Challenge. London Revolution is a two day cycle challenge taking place on the 12th and 13th May 2018, where we will join over 2,500 riders to ride 300km, we will pedal through the heart of the city past iconic sights like Tower Bridge, then up the pace and fill our lungs as we take on the stunning North Downs, the historic Thames Valley and the unrelenting Chilterns with testing climbs, leafy lanes and sweeping descents. Then on the 29th July 2018 we will take part in the Prudential RideLondon-Surrey 100, which starts in Queen Elizabeth Olympic Park, then follows a 100-mile route on closed roads through the capital and into Surrey’s stunning countryside. With leg-testing climbs and a route made famous by the world’s best cyclists at the London 2012 Olympics, it's a truly spectacular event, we will finish on The Mall in central London, shortly before 150 professional cyclists race in the Prudential RideLondon-Surrey Classic on a similar route. So that's the Tahola Triple Challenge, but how can you help us reach our fundraising target? 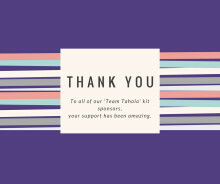 The kit in the image above is from the 2017 Bloodwise London to Paris event, however we have decided to design our own ‘Team Tahola’ kit for the three events and would like to offer you the opportunity to have your logo on it. Outlined below is an example of how the kit may look and is provided to demonstrate the various positions available to you, on the design shown there are 8 prime positions, but we can also add smaller logos on the back pockets of the Cycling Jersey for a smaller donation cost. We are looking for donations in the region of £750 - £1,250 depending on the location on the kit, there will also be other opportunities to sponsor things like water bottles and other essential equipment. The positioning on the kit will be allocated on a first come first served basis and so if you would like to secure a certain position, please contact us as soon as possible. We need to finalise the details for the kit by mid February, so would really appreciate your prompt response. This is a great opportunity for brand exposure and we will also publicise our confirmed sponsors in all of our pre and post event publicity, in addition to the fact that you will be helping us to make a difference in the fight against Blood Cancer. Keep up to date with our journey by subscribing to our blog and help us raise awareness and support our efforts by sharing, as we cycle to beat blood cancer.